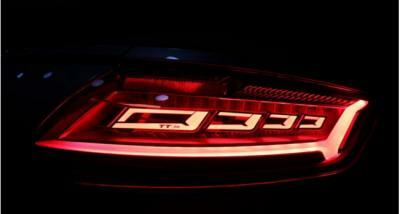 Audi has been playing with OLED technologies for a long time. Back in 2012 they unveiled three OLED lighting designs, and in 2013 they unveiled 3D OLED lighting Audi TT taillight prototypes (developed with Philips and Merck). Several of the company's past concept cars, such as the 2014 Prologue and the 2015 e-tron Quattro adopted OLED displays and lighting technologies.